Use a fitted sheet. Keep loose bedding and soft objects out of your baby’s crib. Make sure your baby gets all recommended shots (vaccines). What about other sleep-related causes of death? Creating a safe place for your baby to sleep also protects her from accidental suffocation. Suffocation is when someone can’t breathe. For example, if a blanket is covering a baby’s mouth and nose, she may not be able to get enough air. This can cause accidental suffocation. 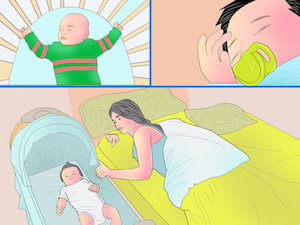 Set up your baby's sleep area next to your bed – but don't share a bed with your baby.